67P/Churyumov-Gerasimenko certainly isn’t a comet that dreads sundown. Images acquired by the OSIRIS instrument aboard ESA’s Rosetta spacecraft in April 2015 reveal that some of the comet’s dust jets keep on firing even after the Sun has “set” across those regions. This shows that, as the comet continues to approach its August perihelion date, it’s now receiving enough solar radiation to warm deeper subsurface materials. “Only recently have we begun to observe dust jets persisting even after sunset,” said OSIRIS Principal Investigator Holger Sierks from the Max Planck Institute for Solar System Research. The image above was captured by OSIRIS on April 25 and shows active jets near the center, originating from shadowed areas on the comet’s smaller “head” lobe. 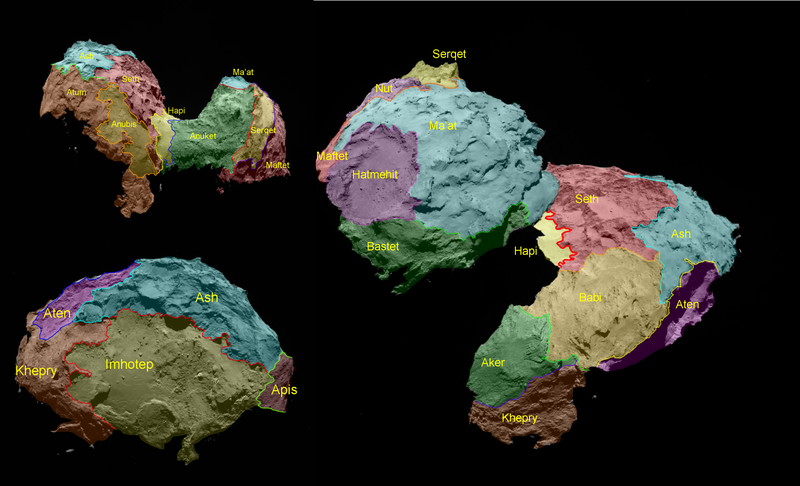 The region is called Ma’at – see maps of 67P’s regions here and here. It’s thought that the comet has now come close enough to the Sun – 220.8 million kilometers, at the time of this writing – that it can store heat below its surface… enough to keep the sublimation process going within buried volatiles well after it rotates out of direct solar illumination. Read more: What Are Comets Made Of? Comet 67P and Rosetta (and Philae too!) will come within 185.9 million km of the Sun during perihelion on Aug. 13, 2015 before heading back out into the Solar System. Find out where they are now. Thanks Jason for keeping us up to date on this crucial mission. Crucial? Yes… it’s so very important to know what these bodies are composed of and how they behave as they approach Mr. Sol. Does outgassing steer a comet? How much? Having a front row seat like Rosetta is just absolutely awesome! What will be revealed next? Next PostNext NGC 2419: Wayward Globular or the Milky Way’s Own?